The 99% reclaim the Capitol. by Nate JacksonDavid Ludden, a Working Washington activist, was firing up the crowd that gathered on the steps of the capitol in Olympia. Ludden was interrupted as a group of people in: top hats and necklaces, tiaras and bolas and wads of cash spilling out of their pockets, rushed the stage and demanded to be heard. A man wearing a top hat, monocle and chewing on an over sized cigar, brandished his diamond tipped cane and shouted into the microphone. The 99% shouted for the 1%* to get off the stage. 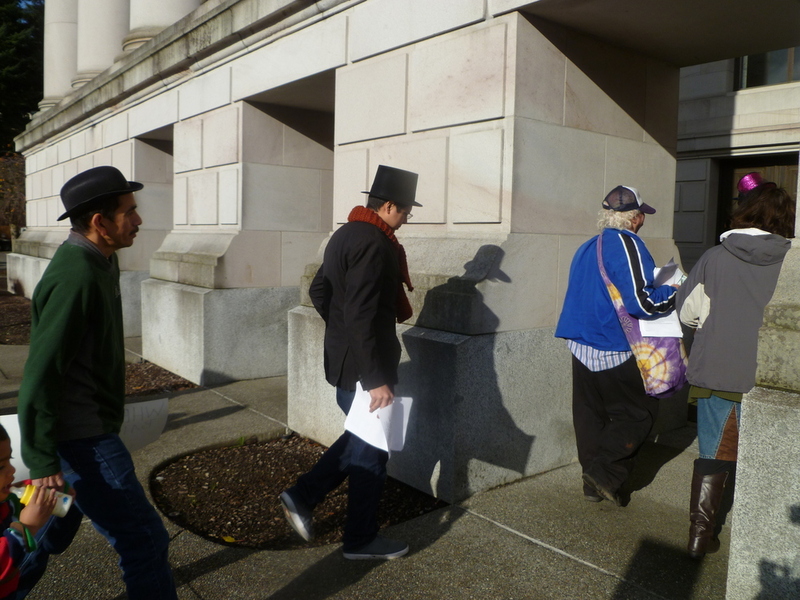 The 1% had come down to Olympia to make sure their agenda was presented to the legislators. They had walked around the capitol handing out their three pronged plan: slash health care, gut education spending and continue to give big banks all the money they wanted. One member of the 1% even got to talk to a representative of the Lieutenant Governor. Sporting a red scarf, top hat and dinner jacket he gave the agenda to a legislative aide. The 99% weren’t going to take it laying down, so we decided to march over to the offices of the Association of Washington Business, a pro 1% lobbying group with an office minutes away from the Capitol Building, to let them know that the 99% were sick of high paid lobbyist determining the course of our state. Of course, when we arrived the AWB locked their doors and barred the entrance. They couldn’t care less about what the 99% wanted. Susan Wilkinson, a superstar Working Washington activist, spoke to the crowd gathered outside the offices of the AWB. Office workers from the AWB looked out from behind darkened glass and pulled out their cellphones to ask what they should do with this crowd of the 99%. *Special thanks to Joshua Welter and the good folks at Washington CAN for playing the parts of the 1%.